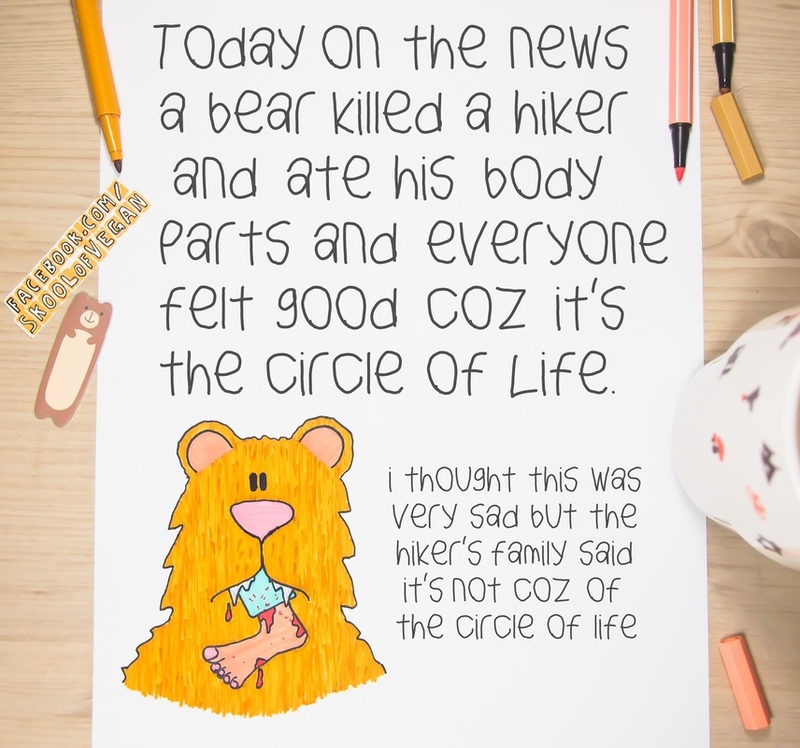 It can sometimes be tricky to pin down just what people mean when using 'circle of life' as a justification for the mass killing and eating of animals. On more than one occasion I've asked those using it to expand on what they mean and found them unable to do so. It's a pretty vague phrase all said and done, but one that conjures up the notion of being in harmony with nature or of somehow being a vital part of earth's natural systems - perhaps that's why people like to say it so much. on this planet. They are born, they live, and they die - and in death they return to and nourish the earth. - We (or other plants and animals) come into existence. - We grow and age. - We hopefully benefit the earth in some way. - We return to the earth (as nourishment). - The cycle continues for all life on earth, over and over again. meaning that if something dies it gives new life to another". ​happens to us, the earth and the animals through animal agriculture and our consumption of animal products. Yes, (massive amounts of) animals are born and killed during this process, but from start to finish there is nothing you could honestly point to as being cyclical, nourishing or of any actual benefit to the planet (other than financial). anything even close to a so-called 'circle of life' or of any process that is beneficial to nature. They harm the planet's ecosystems whilst providing poor nourishment to humans (compared to plant foods) and zero nourishment to the planet itself. we create when we choose to eat animals and their secretions. ​- More than six million animals are killed for food every hour. - We kill around 1,200,000,000 (1.2 billion) animals for food every single week. slaughterhouse dead, dying, sick or injured. the animals suffering a variety of health problems as a result. superbugs and viruses to develop. ranging from freshwater pollution to ocean dead zones, as well as poisoning those in the local communities. - 2500 gallons of water are needed to produce just one pound of beef. - One thousand litres of water are used to produce one litre of milk. - The leading causes of rainforest destruction are raising livestock and livestock feed production. mass extinction event in earth's history (the last one being the dinosaurs). - We currently grow enough grain globally to feed ten billion people, but much of it is instead fed to livestock. - At least 30% of cancers in the western world are dietary-related. It's hard to see how the mass exploitation, harm and destruction seen above is in any way related to beneficial circles of life or indeed anything of use to the natural world, and when we consider these issues with a logical mind it's pretty clear that 'circle of life' is little more than a romanticized appeal to nature fallacy. ​ gives ​a truly sobering perspective.